The Koji room is not like the other parts of a brewery: it is hot like the desert midday and humid as a swamp; it is also quiet due to wooden construction and heavy insulation. Even with its oppressive heat and humidity, the room is peaceful. In this room Sake brewers start the process that will transform a pile of rice into delicious and complex Sake. Unlike numerous other fermented beverages, Sake relies on two microorganisms, not yeast alone. The other organism is Aspergillus Oryzae or, the much easier to say Japanese term, Koji. To make any alcohol, you need sugar. Yeast eats sugar and makes alcohol and carbon dioxide. In wine making, the sugars are easy to get to — grape juice is sweet and crushing the grape skin makes the sugar available. Beer brewing requires that someone “malt” the barley, so that enzymes in the barley kernel convert its starches to sugar. Crushing the malted grain and mixing it with warm water releases the sugars. Rice sugars are harder to get at; it’s a starchy grain that cannot be squished like a grape or malted like barley. To convert rice starches into sugar to make Sake, roughly 20% of the rice spends time in the Koji room getting inoculated with fungi spores. This fungi, when propagated on the rice, will later produce enzymes in the tank to convert the rice into sugar. This unique brewing process is like malting and brewing in one tank at the same time. It is called heiko fukuhakko (平行複醗酵) or “double parallel fermentation”. Growing Koji well is the cornerstone of Sake making, but there are many schools of thought to growing Koji. 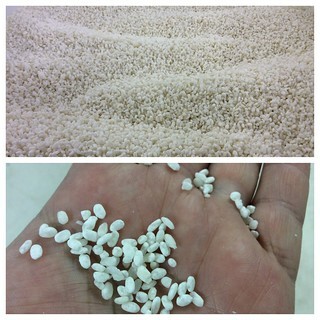 For us, it means developing healthy Koji that will provide the most enzymes possible. Working in the Koji room involves flipping, cooling, mixing, and wrapping Koji-inoculated rice; to the observer, these activities must seem mysterious. However, these actions have purpose. Working with the rice in this way controls two factors: temperature and moisture content. The temperature must be kept high enough to encourage the Koji through its growth cycle, but not so hot that it dies. Properly controlled moisture reduces stress on the Koji. Once Koji growth starts on the exterior of the grain, the moisture content reduces causing the Koji to chase the water and extend roots (“hyphae”) into the grain. The more the brewer dries the exterior of the rice, the more hyphae growth is encouraged. The end product is a rice grain filled with hyphae ready for the Sake brewing. When brewing begins, Koji is mixed with water, activating a gene in the hyphae that promotes enzymes to convert starches to sugar. Since the fungi grew under low stress conditions (warm and humid), the plant used very little of its own energy to fuel this growth, resulting more of the enzyme we need to make Sake. There is a well known Japanese saying: 一麹、二もと、三作り。Essentially, “first Koji, second yeast starter, third making”(brewing). This illustrates the importance of Koji growing to a batch of Sake, and for us it serves as a guide to running our brewery. While some products, like miso, shoyu, or even pickles can be made with a simple Koji grown only on the outside of the grain, this is not an adequate approach for premium Sake. The harder to grow Koji simply makes better Sake. For a new brewery, you’d expect a lot of test brewing. We’ll get to that, but in the beginning, while we wait for the government paperwork, we will be working on just growing Koji. That may seem boring to some, but for us, we know that the first step in making great Sake is spending endless hours in that hot and humid room trying to grow the best Koji there is.